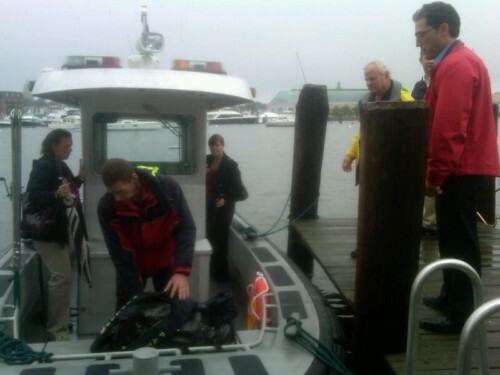 Annapolis Mayor Joshua J. Cohen announced that the City has received the first of two cutting-edge propulsion systems, mounted on Harbormaster boats, helping to save the Bay while saving the City money. Only a dozen of these hybrid diesel-electric-solar propulsion systems exist worldwide and Annapolis was awarded grant money to purchase two of the twelve. The system updates were available through grants awarded by the United States Environmental Protection Agency (EPA) and the Canadian Government. The EPA funded $300,000 of the $400,000 price tag to update both boats and the Canadian government funded the remaining $100,000. Mid-Atlantic Regional Air Management Association (MARAMA) was responsible for securing the EPA grant for Annapolis. The patrol boat will be used to collect mooring fees and will also be used as a water rescue boat as needed. The second boat, due to arrive in Annapolis in January of 2012, will have the propulsion system mounted on a pump out boat. “As part of the City’s Clean & Green initiative, this project addressed the need for resources on the water directly affecting the health of the Bay,” Mayor Cohen said. “I want to thank the Mid-Atlantic Regional Air Management Association for leading the effort to get the EPA grant money for this project. It’s one more example of how municipalities are relying on partnerships to generate large outcomes with limited budgets. County Councilman, Chris Trumbauer gets an up close look. The patrol boat is operated by the Harbormaster’s office and will run on battery power for one-half of its life cycle, which is about 20 years. Overall, the city will see a 50% savings in fuel costs over the life of the boat. 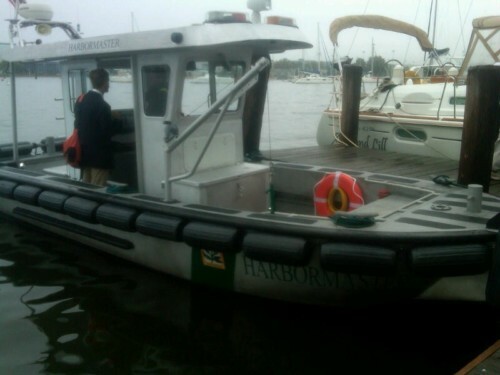 The City of Annapolis owned both the patrol and pump out boats prior to the addition of the new hybrid systems. The vessels were sent back to the original builder, Metalcraft Marine in Kingston, Ontario for the state-of-the-art updates. The City of Annapolis’ two diesel powered harbor boats are fitted with a Steyr Hybrid D solar-electric-bio-diesel propulsion system. The system operates the boats on solar power and batteries for up to three hours at speeds up to six knots without a requirement to turn the diesel engine on. Three-quarters of the harbor is subject to a six knot speed limit imposed by state law. By using emergent solar and renewable fuel technologies fuel consumption is reduced by up to 50% and emissions by over 50% in a given period. Because of the new engines, in low speed situations, the diesel engine will not even be required. This is a key element in the program as ninety percent of the harbor patrol and pump out boat activities are conducted at speeds less than six (6) knots. At these speeds, under ordinary circumstances the diesel will not be used, therefore will burn no fuel, and emit no pollutants. Due to gains in efficiency, the Steyr engine will produce 20 to 35 percent more power than the existing engines when needed for higher speeds. They also weigh less than the engines being replaced and burn significantly less fuel. Additionally, the new replacement engines will burn bio-diesel fuel providing even more environmental benefits.